The iBreviary app is your portable breviary. You can use it to pray with the full texts of the Liturgy of the Hours in just five languages. Simply launch the application and you will stand before all the texts of the day. The texts of the Liturgy of the Hours, are formatted just as they appear in the printed version. The iPad version of the iBreviary app then, thanks to the generosity of the screen, returns the feeling of holding a book with all the comfort you have Apple applications. We first reviewed iBreviary in December of 2011, and a lot has changed in five years. I am so glad that this sacramental Breviary app has stood the test of time. What Does The Pro Terra Sancta Mean? In essence, after doing some reading on their site, it means that iBeviary supports the Holy Land. The Association pro Terra Sancta is the nonprofit, nongovernmental organization (NGO) of the Custody of the Holy Land with offices in Jerusalem, Rome and Milan. The Custody of the Holy Land is the name by which today are known the Franciscans of the Order of Friars Minor (founded by St. Francis in 1209) who have been present in the Eastern part of the Mediterranean since the earliest days of the Order, and who watch over the Holy Places in the name of all Christianity. On the occasion of the millennial celebration in 2000, Pope John Paul II once again reminded the world that the Friars Minor were custodians of the Holy Places by the will of the Universal Church. What’s in this Catholic Breviary App? There are a number of other Breviary apps in the iTunes store, but this one has some special qualities. And I am going to jump on my favourite first. That is offline loading of the text. You can load up to 15 days to use off-line. That seems like it isn’t a lot but if I go on two weeks vacation, say to a ‘off the grid’ type of place, like camping for instance, this is very handy. Now granted, there aren’t a lot of places left that don’t have some sort of Wifi, but having the ability to download the text before hand will same me time later. A new feature for version the new iBreviary for iPhone is automatic reading of texts. Going into view SETTINGS (Settings), you can enable the feature by activating the button. Entering in the texts of the Breviary, it will be displayed in the lower right corner, an icon “Speaker”. Clicking on this will activate the function of reading voice. That’s voice. Pretty neat. Now maybe this will make you feel less alone? Now, this will be great for priests that need the daily readings handy for reflection and prayer. The iBreviary offers you the complete daily missal to follow the Mass or, if you’re a priest, even to celebrate it. It is similar to the missalettes and worship aids found in your church. I have yet to convince my local parish priest to have his iPad on the Alter, but I could definitely see him using this on a youth bus trip, or when he is travelling for World Youth day. Are you in a quiet place, finding yourself wanting to pray a rosary or the Way of the Cross? These prayers can be found in other apps, but here there are all in one. That’s handy, that’s a blessing! The iBreviary offers all the major Catholic prayers and more! 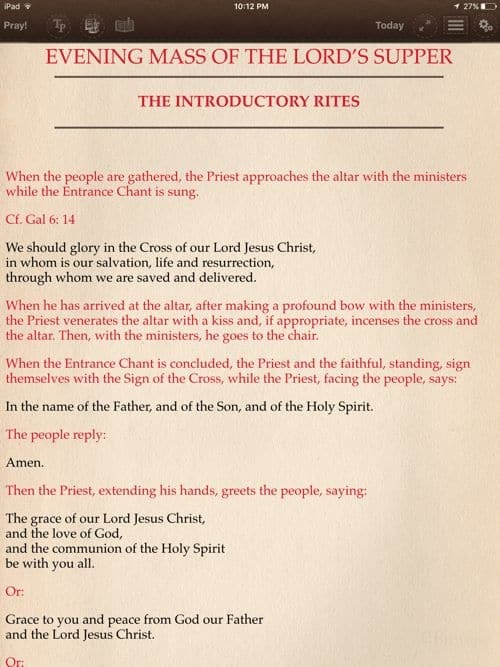 The iBreviary also offers the complete texts of the rites for the celebration of all the sacraments: the Anointing of the Sick, Viaticum, Marriage (including the readings), the funeral rites, Communion of the Sick, and many other rites useful for meditation, prayer and pastoral ministry. Again, this is very good for those that are ordained. iBreviary is available in English, Italian, French, Latin, Spanish, Romanian, *Portuguese, *German, *Arabic (*soon to be published). Catholic daily readings all on your iPhone or iPad. Would I Use It? Should You Use It? YES! While studying in seminary I was required to have the four volumes set of the Breviary. That set was heavy, it was thick books of thin, fragile onion paper (typical of bible and other such THICK books). It was a lot to get used to, flipping pages, jumping through ribbons, and then searching to find feast days, and special prayers. This makes praying with the Church EASY. Perhaps you have never prayed the official prayers of the clergy and the church. Try it out, there is a lot to take in a first, but once you get used to the rhythm of praying the Liturgy of the Hours, it becomes much deeper than just reading and reciting.